Outfitted with a modernize infrastructure, we have established ourselves as the prominent manufacturer, trader and supplier of high quality Mortise Door Handle Sets. Prominent for their matchless quality, these door handles are attentively manufactured using superior grade basic material and newest technology. Provided door handles are offered in numerous stipulations to satisfactorily meet the varied desires of our clients. • More than 800,000 times lifecycle tested. The latchbolt & deadbolt will retract simultaneously by turning the interior lever (patented). 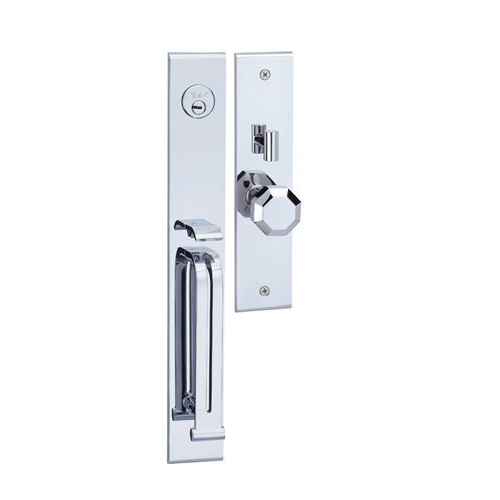 Yale M8773 Series mortise door handle-sets are forged from solid brass. Comprising an ANSI grade 2 mortise lock case with latchbolt/deadbolt functions, these door handle-sets have long lifecycles than exceed 800,000 uses, making them the perfect choice for exceptional high security. High quality PVD finish of Yale door handle-set series provide lifetime protection from corrosion and tarnish too. Yale mortise door handle-sets are designed in a variety of styles. The classic styles make a bold statement to any door, while the elegant styles enhance the mood of your home, evoking feelings from the modern to the dramatic. Annual Turnover2013-14 Rs. 10-25 Crore Approx. Year of Establishment 2008, we “Kismat Hardware”, are leading company occupied in Trader, Wholesale and Supplier highly reliable assortment of Biometric Fingerprint Digital Lock, Touchscreen Digital Mortise Lock, Card Digital Door Lock, Yale Deadbolt, Door Lever Handles, Door Guard, Geze Boxer Counsel Door Closer, Overhead Door Closer, etc. Situated at Pune (Maharashtra, India), we are supported by reliable vendors of the industry in order to offer our clients high reliable array of products. Our vendors have been selected on the basis of their market reputation, production techniques, financial conditions, delivery schedule and quality of products. Managed under the direction of our General Manager, “Mr. Hanuman Badrecha”, our firm has covered major share in the market. Moreover, we are assured by our vendors that offered products are stringently tested on various quality parameters using advanced testing devices and tools by their experienced quality auditors in order to deliver flawless product range at clients’ end.